Mmmmm! 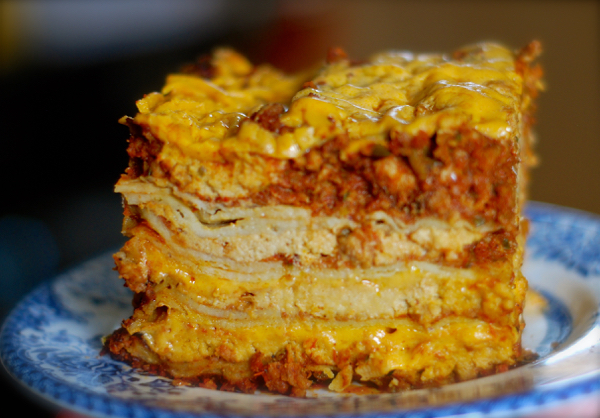 This Vegan Crock Pot Taco Lasagna is a cross between an enchilada stacker casserole, and a lasagna. The best of both worlds come together in this delicious, easy Crock Pot meal! I love how crock pot lasagnas stay ooey, gooey, and cheesy on the inside, and form a flavorful, almost crunchy outside “crust” from the cooked pasta, sauce, and cheese cooking for a long time at a low temperature. Some people buy special pans so all of their lasagna slices have this wonderful contrast. I guess that’s cool too, but ya gotta love the ease of a well constructed slow cooker dish! Place all ingredients in the bowl of a blender and pulse until very creamy and smooth. Scrape down sides of blender bowl as you go. Be patient, this will take some doing if you don’t have a high speed blender. Heat olive oil in a large, heavy skillet. Once hot, add the crumbles and brown a bit. Add the beans, salsa, stock, and the rest of the seasonings. Cook just until crumbles are heated through and the sauce has thickened a bit. Remove from heat, cover, and set aside. Put a little bit of sauce, in an even layer, on the bottom of a 6 to 7 quart Crock Pot. Top with 3 soft corn tortillas, 1/4 of the meat/bean sauce, 1/4 of the ricotta, and 1/4 of the cheddar. Repeat layers, ending with the cheddar. Cover Crock Pot and set on LOW for 6 to 7 hours, or until very hot all the way through and all the cheese is melted. Uncover and allow to sit for 15 to 30 minutes prior to serving. Tip: To get perfect slices, allow lasagna to come to room temperature. Cover and refrigerate overnight. The next day, slice the lasagna while cold and reheat individual slices in microwave until heated through.